Maybe you have read or heard there is supposed to be a super-blue-moon-eclipse this month. Yes, there will be an eclipse. But I am sorry to report that it isn’t that super, and I don’t think it is blue either. Total lunar eclipses are fun to watch. They are nowhere near as spectacular as total solar eclipses, but many more of us will have a chance to see several during a lifetime. This month you have a chance to see one early in the morning on Jan. 31. Every six months, there is a chance for a lunar eclipse, but not all are total. Amazingly, in 2014 and 2015, there were four total lunar eclipses. Any time a lunar eclipse happens, everyone on Earth has about a 50-50 chance of seeing it. You just have to be on the side of the Earth facing the moon. If you miss the total eclipse this month, there will be another one in January 2019. However, neither of these eclipses will be of a blue moon. If something is said to happen “once in a blue moon,” you know it is a rare event. One can even apply the term to the correct usage of “blue moon.” There are 12.37 moon cycles during a calendar year, so every three years or so there are 13 full moons during a year instead of 12. A blue moon would be the third full moon during a season that has four – at least according to the Maine Farmers’ Almanac. Rarely can the first erroneous use of a term be so specifically pinpointed. A March 1946 article in Sky and Telescope magazine incorrectly interpreted the Maine Farmers’ Almanac and suggested a blue moon was the second full moon in a calendar month. That article was referenced many times, and the usage has become widespread in popular culture even after Sky and Telescope corrected the misconception. By the almanac definition, the next “true” blue moon occurs on May 18, 2019. By the two-in-a-month definition, we have to wait only until March for another blue moon to happen. I like the even earlier story of the origin of the term. Easter depends on the timing of the moon after the Vernal (spring) equinox. When an “extra” moon happened to throw off the timing of the liturgical calendar, it was called a betrayer, or “belewe,” moon. I guess it betrayed everyone who might be ready to end their fasting for Lent. 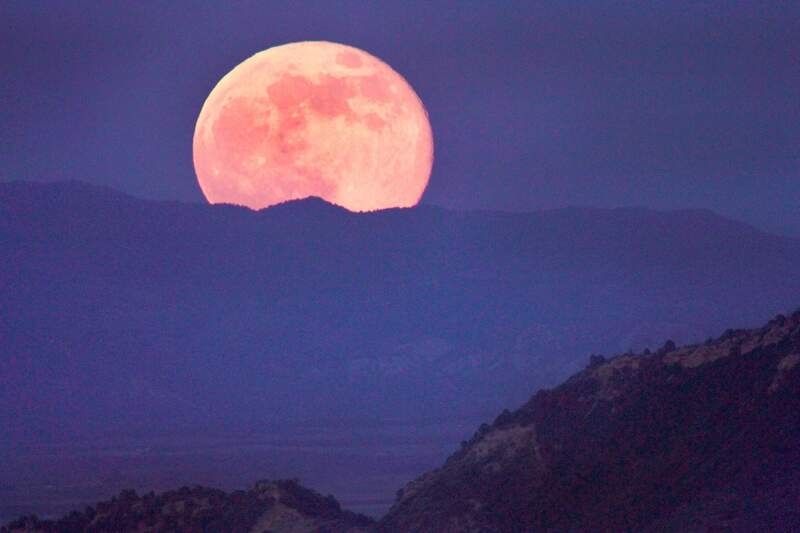 A supermoon is a term straight from modern pop culture. It refers to when the full moon coincides with perigee, or the closest approach the moon makes to the Earth in its elliptical orbit. Perigee happens every month, and full moons happen every month, so it is not unusual for them to regularly coincide. Usually, the full moon closest to perigee during a year will get the title “supermoon.” This month that honor goes to the full moon we had New Year’s Day. The full moon on Jan. 31 is happening a full day after perigee, so it will only be almost super. Since there is no consensus as to how close to perigee a full moon needs to be to be called super, you can call this one super, if you want. This monthWatch the eclipse. Even if the moon isn’t blue or super, it is still the moon, and it’s lots of fun to look at, especially through binoculars or a telescope. The planets are not in the greatest place for viewing this month. Venus is lost in the glare of the sun. Mercury and Saturn might be visible when they cross the horizon in the east at about 6:30 a.m. Bright Jupiter and dim Mars are near each other a bit earlier in the morning eastern sky, as they rise a little after 3 a.m.